Kohei Chiba, Japan and Jun Jo, Hawaii collaborated to design this particular model. Both surfers flew across the pacific for a few years to test to the design which can suit small beach break waves , to barreling reef breaks. Despite its wider nose design, it will turn very sharp in any situation. Even with 5 plugs for various fin settings, the tail area is narrow and tight for the round pin tail design. This will promise smooth & speedy surfing. Quad set up for more speed, Tri fin for more vertical turns. With it’s creative mixed design, this model eliminates the need of multiple boards in the board bag. You will choose the set up, then surf, rather than allowing the conditions to dictate which board to use. What I have been thinking for a long time is how I could design one surfboard that you could ride in all conditions. From flat mushy surf to bigger hawaii waves. So me and Kohei started to design a perfect board that would work like how I wanted. We wanted to make a board that would work for everything. 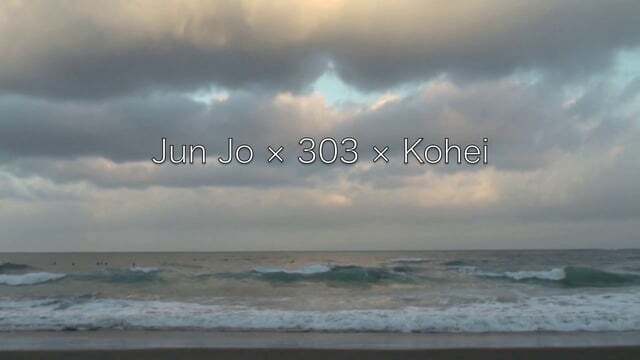 So with the Jun Jo x 303 Surfboard you can see how it would work in all conditions. There is a few important parts of the boards. One is the width in the front area of the board , what this does is give you enough floatation to paddle into waves easier and once riding the waves it gives you more glide on the waves. Another point is where the board is wide the outline goes narrow like a gun what that does is usually with shorter boards most people make wider tails with makes where you cant turn hard , so with the narrow tail you can sink the tail when on the wave and really turn hard where ever you need to on the wave. So what you have is glide / speed with the wide front of the board and narrow tail so you can turn hard its the best combination. Last point is the 5 fin set up where you can make it a quad or tri fin. Depending on waves you can change it around . For me I use the quads for waves that I need extra speed which means either when the waves are weak or the waves are very down the line. I use tri fin when I don’t need too much speed and want to go more off the bottom off the top. As you can see you can use this board in all kinds of surf. When traveling I only need this board. Its perfect.